Happy Hol-lean-Days number 4 – everyone needs a little support at this time if year – and one of my favourite forms of festive help is my supplement stack. Of course it can be argued that with a good diet you shouldn’t need to supplement – but at this busy and stressful time of year it isn’t always that easy to get the nutritional support our bodies and immune systems need, especially when still training hard. 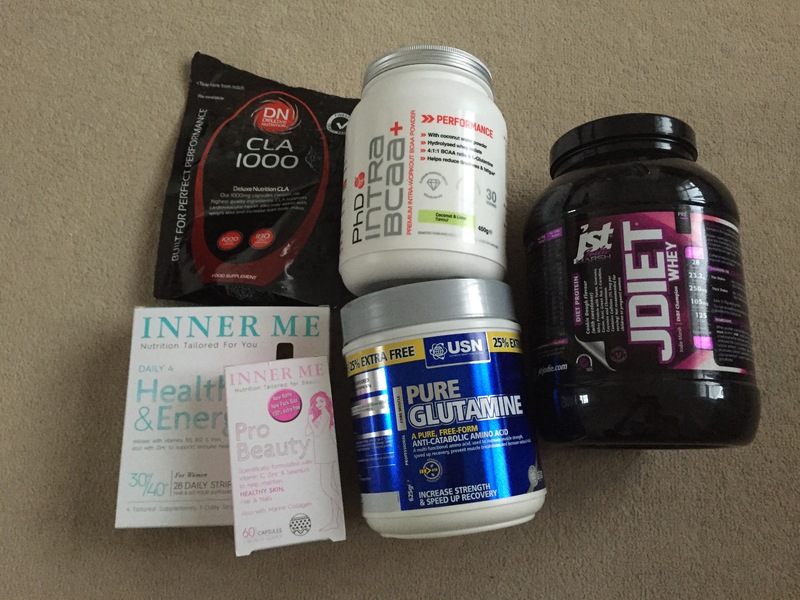 So I like to offer my system support in the form of supplements. As promised via Instagram, this post has full details and links of exactly what I take every day, with links of where to purchase. As you can see above, my essentials are: Inner Me Nutrition Daily 4 30+ Strip (a multi vitamin, omega 3, probiotic and co-enzyme Q10), Inner Me Pro Beauty (vitamin C, zinc and selenium) and CLA tablets (to help maintain lean muscle and assist my body in burning fat) every morning, a daily protein shake made with Jst Jodie Diet whey (to help reach my daily protein macros, and help me stay full during busy mornings), into which I add extra glutamine for repair and recovery and finally a scoop of PHD Woman Intra BCAA in my workout water bottle to help prevent fatigue, speed up recovery and give me some fuel to power through my training. I also make sure my gym bag contains healthy snacks I can eat on the go – Protein Bars are easy, convenient and a great way to hit my macros or recover after a workout. Working long hours, having a physically demanding job (teaching and training sometimes twice a day, not to mention walking everywhere), stressing about my busy schedule and being constantly on the go means I can’t always get the optimum amount of vitamins and nutrients from my food, and that my body is sometimes under stress, not to mention the fact that there often isn’t time to recover from one workout before I head into the next one means I want to give myself the best possible chance to stay fit, healthy and fuelled right up until my festive break. This fantastic combination gives me what I need to perform at my very best every day and is by no means substitute for a good diet, more a friendly nudge in the right direction. If you too feel like you are under stress, on the go and potentially not eating as well as you could then taking supplements could definitely help you through the Christmas period. Everyone has different nutritional needs so do your research to workout the best supplement stack for you, and as always please feel free to ask any questions!